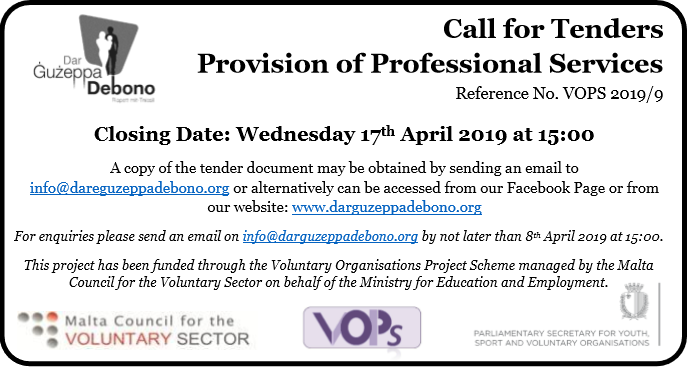 The chairperson of the Board of Governors of Dar Ġużeppa Debono Association invites suitable qualified individuals to submit their curriculum vitae for the engagement of an officer to administer and manage at Dar Ġużeppa Debono. The Association is established as a national non-profit making, non-political association with a philanthropic, cultural and educational purpose in order to give support to single parents and families in various stages of their lives. It also aims to promote the value of life through educational programmes aimed at all sectors of society. Dar Ġużeppa Debono Association would like to recruit the services of a qualified person who will administer and manage at Dar Ġużeppa Debono as from January 2017. Administrative related qualifications and not less than one year experience in a related post is considered mandatory within this call, and qualifications and experience claimed must be supported by certificates and/or testimonials, copies of which should be attached to the application document. Original certificates and/or testimonials are to be invariably produced for verification at the interview. the statement, issued by the pertinent authority, to the receiving department as soon as available and, in any case, by not later than one month from the closing date of the call for employment. We are seeking an individual who is organised and detail oriented with good analytical skills to run day to day operations. Applicants must be proficient in both written and verbal Maltese and English languages and must also have computing skills. The Officer at Dar Ġużeppa Debono should be of good moral character. The appointment is on a part-time basis and is subject to the policies of Dar Ġużeppa Debono Association. Work by the officer should be carried out in the office of Dar Ġużeppa Debono, Għajnsielem Gozo. Working hours which include 20 hours per week are to be discussed with the applicants during the interview. Engagement will commence in January 2017 and is subject to a probationary period of one year. Sufficient time should be allowed in order to ensure delivery by the above deadline. 8. Eligible applicants will be short-listed for an interview by a Selection Board to assess their suitability for the post.